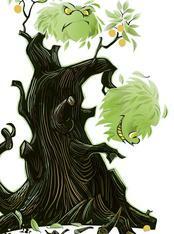 TWO SERPENTINE, SQUABBLING SIDES SPROUTING FROM A SHARED TRUNK. 'SHE' SIDE IS PERPETUALLY PISSED, 'HE' SIDE IS MORE DOORMAT, I MEAN, DORMANT. TOGETHER, THIS IS AN ILLTEMPERED ‘PAIR’ TREE THAT BEARS BITTER FRUIT. “Go ahead. Take a bite. Spoke the apple on the tree. How tempting just a taste can be!"